Fall is on the way, which is a good time to give your AC a rest and rely on ceiling fans to keep you cool, calm and collected. Cooler temperatures make this the perfect time to turn off your air conditioner and turn on a ceiling fan to start saving energy and money. Sept. 18 marks the third annual National Ceiling Fan Day (NCFD), which promotes reduced energy consumption. If every American participates in NCFD by turning off their AC and using fans for their cooling needs, the United States will save enough energy to power the entire city of New York for months. And it saves money too. Operating a fan can cost as little as $1 per month. That is quite a savings compared to approximately $100 per month to run an AC unit in a typical home. See the newest ceiling fans and lighting products at Hortons. What is the right size ceiling fan for an 11-by-10-foot dining room with an 8-foot ceiling and a 48-inch round table? 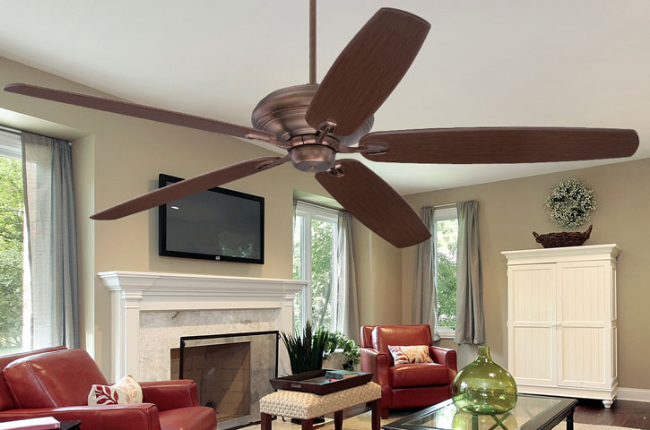 The ceiling fan should not be larger than 12 inches less than the width of your table, so your fan should be approximately 36 inches in diameter. However, because your fan will hang higher than a typical chandelier, you could go up to a 42- or 48-inch ceiling fan. To find the most appropriate and aesthetically pleasing fan for your home, visit a Hortons showroom. There, you will find professionally trained personnel and a large selection of ceiling fans and light kits.